Here you can see how the bezel brings up hot corners and other hot areas when touched. This image shows a method on how the sensor circuitry would be spread through the bezel. 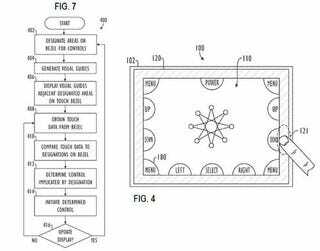 According to the patent, the system will allow to discriminate between groping and actual touch actions on the bezel. It will also change the orientation of the corners as you rotate the display, so they are always in the same position.